It began as The Raymond Hill Community Center (RHCC) a little over two years ago with a few Raymond individuals who came together to offer a space of gathering for the Raymond and Lakes Region communities. The goal and mission were to provide an open and welcoming space for people of all ages and backgrounds, sharing thoughts, ideas and/or creative projects; and to promote community connections. Challenges were faced in the beginning, but due to a dedicated few who embraced a stick-to-it attitude, the RHCC morphed into the Raymond Arts Alliance (RAA) one year ago on January 20th with the same mission in mind. It’s been a year of success, to say the least. When RHCC began, the events were held at the Riverside Hall located at 7 Raymond Hill Road in Raymond. Challenges arose at the beginning – such as being unable to continue financing artistic and community endeavors during the heating season and meet a monthly rent. As a result, some apprehension regarding all the logistics and legalities of having and hosting such events made the path to continue with the mission of the organization difficult. With most giving up on the project, Duffy and Wittner stayed with it – alone - to carry the torch. Until, that is, a little library and a small church with a big heart came along and saw the value of RHCC’s goal. A full year of music, magic, comedy, poetry and more. 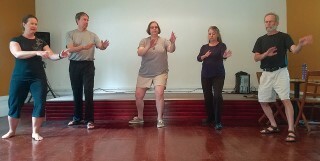 *Saturday morning Qigong/Tai-chi exercise program. For those who are inspired to do something just as meaningful but are currently facing a hurdle along the way, Duffy shares some encouragement and what she learned about hanging in there during times when your dream seems out of reach. So, if it seems that things are not going as planned or meeting your agenda, remember that your dreams and vision can manifest at any time. Don’t give up.